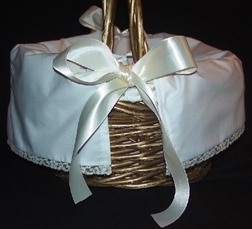 Each of our heirloom flower girl basket covers is hand crafted with the finest imperial broadcloth fabric. It is trimmed with French lace and ties at the sides with 1.5 inch satin ribbon. The front of the cover can be monogrammed with 3 initials in our beautiful Empire font. 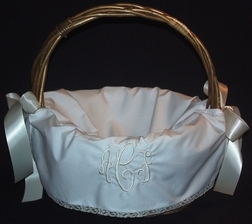 While the most popular color scheme for the basket covers is white fabric with ecru ribbon, lace and monogram, you may choose all white or all ecru. Regular size cover: Fits square or round baskets with diameters of 10 to 12 inches. Large size cover: Fits square or round baskets with diameters of 13 to 15 inches.